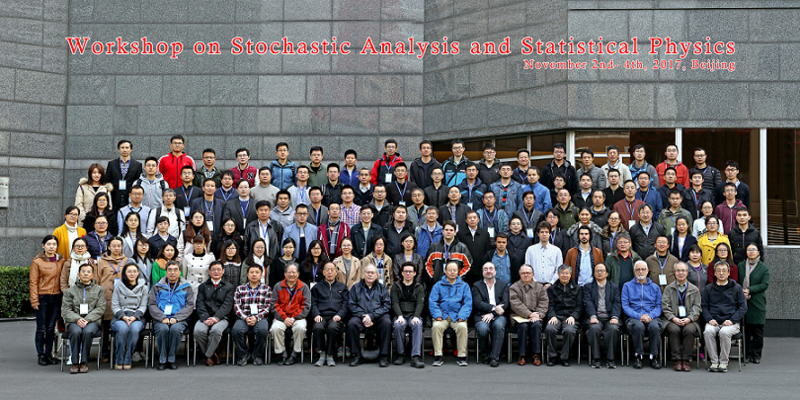 The Short Programme on Spatial Probability and Statistical Physics, which is sponsored by Hua Loo-Keng Center for Mathematical Science, was organized by AMSS, CAS in cooperation with Shanghai New York University and held in South Building 202 (AMSS, CAS) on October 9th - November 1st and November 5th – 10th, in the Conference Hall of Siyuan Building (AMSS, CAS) on November 2nd – 4th. It was composed of 9 mini-courses, 18 seminar talks (one or two hours for each one), a three-day workshop on November 2nd – 4th and a one-day youth forum on November 5. Over 150 scholars from America, Argentina, Brazil, Canada, Chile, China, England, France, Hong Kong (China), Japan, Macau (China) and Switzerland participated in this conference. There are about 60-hours lectures in total for all the mini-courses. 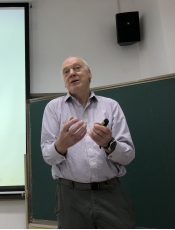 Professor Vladas Sidoravicius (one of the two chairs of the conference) from Shanghai New York University gave an 8-hours mini-course (3 lectures) about the percolation theory on October 12th, 19th and 26th respectively. The speakers of seminar talks include Professor Gerard Ben Arous from New York University (who is a member of the American Academy of Arts and Sciences and the former director of Courant Institute), Professor Mu-Fa Chen (who is an academician of CAS), Professor Geoffrey Grimmett from Cambridge University (who is a fellow of the Royal Society) and Professor Takashi Kumagai from Kyoto University (who is the deputy director of Research Institute for Mathematical Sciences). Thirty-two probabilistic researchers gave talks during the workshop from November 2nd to 4th. Professor Wendelin Werner from ETH Zurich, who was awarded the Fields Medal in 2006, reported his recent results on Gaussian Free Field with Neumann boundary conditions on November 2nd. Other speakers include Professor Erwin Bolthausen from ETH Zurich (who is a member of German Academy of Sciences Leopoldina), Professor Yves Le Jan from the University of Paris-Sud (who is a Senior Member of the Institute University of France), Professor Charles Newman from New York University (who is a member of the National Academy of Sciences and American Academy of Arts and Sciences, and a fellow of the American Mathematical Society) and Professor Shige Peng from Shandong University (who is an academician of CAS).